Some things are worth waiting for and machinarium, the point-and click game I announced in an earlier post (see the April 2009 Folder, Educational Computer Games.1) has arrived. It was worth the wait. I am currently playing it through, savoring every minute, and looking forward to the Christmas visit of Joshua and Jordann so that they can play along with grandad. We won’t finish the game before they have to go home but I’ll put it on their new laptop. I’ve read several reviews of the game, all positive, and agree that the gorgeous, hand-drawn graphics, inventive animations, cool sound track, challenging problems and puzzles, all make machinarium a candidate for Game of the Year award in the Independent Developers category. 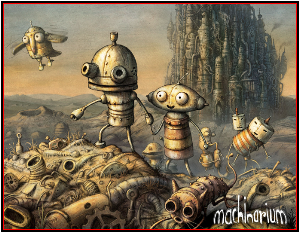 Machinarium is the story of a gusty little robot and his adventures rescuing a varied crew of robot friends (including a robot cat) from a band of black-hatted robotic bullies. The game is a great arena to help kids exercise their problem-solving skills. These are general skills (perseverance, start somewhere, experiment using trial and error, draw a picture, etc.) that are not tied to a specific curriculum, like math. Kids will love the game but may become frustrated with some of the problems and puzzles. Even though the game has a well-designed in-game hint system, I would like to focus on techniques that we, as grandparents, can use with kids to help them solve the problems and puzzles. 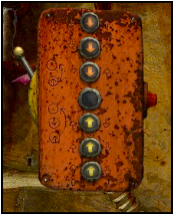 Machinarium is full of control panels and switch boxes that operate equipment needed to progress in the game. But none of the machines come with operating instructions! You have to push buttons, flip switches, pull handles, observe what happens, and figure out how to control each machine. For example, the box in the picture below controls an electromagnet. Just to the right of the handle is a penciled diagram some robot has added as a reminder as to the rules for manipulating the arrows. Note that the arrows have different colors, one set yellow, the other red. The arrows have to be pressed in a certain sequence. But what’s the sequence? One problem-solving skill is to reframe the problem in a different context. This puzzle is a version of a classic peg-jumping puzzle. To reframe the puzzle, I drilled seven holes in a block of wood, sanded off the heads of three red golf tees and three yellow golf tees. 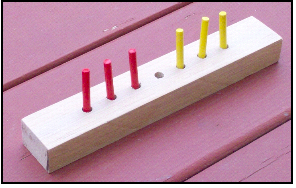 The goal is to jump the pegs so that the three yellow are in the three holes occupied by the three red and vice versa. You can only jump one peg forward into an empty hole, at a time, and a peg can never move backwards. A friend at the office has a third grader that was stumped with this puzzle. I made the wood version for mom to take home and was told the next day that Jacob quickly solved the peg-jumping problem, went to the computer, duplicated his solution, turned on the electromagnet and lifted a metal crate from the top of a stack of two crates. A single crate is needed to get to the next puzzle. Here's another puzzle that's best worked on with paper and pencil. Well into the game the robot hero comes across this panel. Clicking on a bulb lights it it up. Click another bulb and the line connecting the two bulbs lights up. At first, kids will click around, lighting bulbs and lines, but will find that nothing happens. Looking around the room it becomes evident that a graffiti artist has scrawled a series of geometric diagrams on the wall. Aha! These are line-tracing problems. The example below shows the solution to tracing the diagram on the left without tracing over a preciously drawn line. 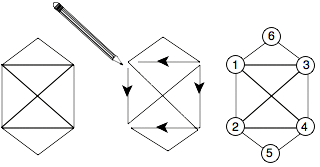 In other word, the figure can be drawn without lifting the pencil from the paper and re-crossing any line. The diagram on right represents the order to click on the bulbs, 1-2-3-4-2-5-4-1-6-3-1. Now the kids can trace the other diagrams they need to solve to move on. As I find a puzzle or problem that’s best solved off-computer I’ll post a short description of the method you can use with kids. Resist the temptation to use the Help system until you or the kids have exhausted every idea and frustration is beginning to spoil the game. Solving a puzzle or problem is a great confidence builder for kids. Solving a difficult problem is one of the sources of real self-esteem. Machinarium is available for $20 as a download on Steam (www.steampowered.com). I bought the Steam version for my gaming PC. I also went to http://machinarium.net/demo/ and bought the $20 download from Amanita Design, the Czech company that produced the game, for my Mac laptop. Their download gives you PC, Mac, and Linux versions of the game plus the soundtrack in mp3 format for loading into your iPod. A demo of the first two areas met in the game is also available at the site.